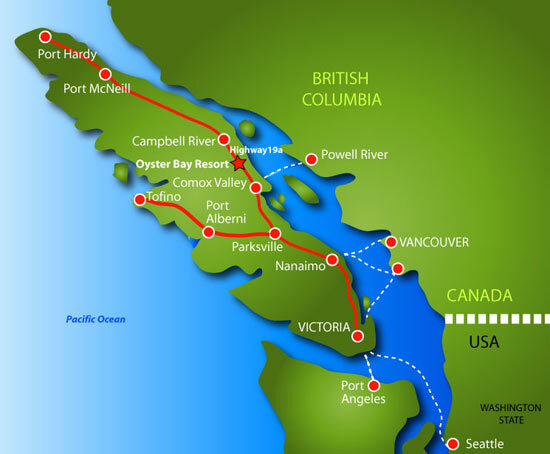 Oyster Bay Resorts is located 25km south of Campbell River on the east Coast of Vancouver Island. The area is accessible by air into Campbell River and Comox from Vancouver, or by car traveling north across the Island on Highway #19A. Passenger ferry services onto Vancouver Island are available: Seattle to Victoria, Port Angeles to Victoria, Vancouver to Victoria, Vancouver to Nanaimo and Powell River to Comox. Click here for printable version . located in Victoria, Comox and Nanaimo and car rentals are available. Ferry service runs from Horseshoe Bay in North Vancouver to Nanaimo’s Departure Bay as well as from Tsawwassen, south of the airport, to Victoria’s Swartz Bay and Nanaimo’s Duke Point terminals. Take Highway 1 North from Victoria to Nanaimo. Continue North on Hwy 19 from Nanaimo. Take exit 144 Hamm Road to the Old Island Hwy 19A. Turn left and follow the road until you see our sign approx 5 kms. The drive will take approximately 3.5 hours. Take Highway 19 North from Nanaimo. Take exit 144 Hamm road to the Old Island Hwy 19A, turn left and follow the road until you see our sign approx, 5kms. The drive will take approximately 1.5 hours. Fly from Seattle, WA (and many other locations) to Victoria or Vancouver, and rent a car from there! Fly WestJet to Comox on Vancouver Island, and rent a car from Budget Car Rental or National (approx. 20 minutes drive (32 kms) from airport to Resort). Budget Car Rental: 1-800-268-8900 or 250-754-7368. Fly to Nanaimo or Campbell River on Air Canada Jazz, rent car from Budget Car rental (approx. 1.5 hour drive from Nanaimo airport to Resort & 15 minutes from Campbell River Airport).